The lower two lines read storage and warehouse, but the line above I have not been able to make out. It should, however, read Regal, since this building was the home of the Regal Storage Warehouse Company for 76 years, from 1920 to 1996. The original proprietors of the Regal Storage Warehouse were Henry Freeman (1860-?) and Joseph Wielar (1864-1928?). The business began at this location as Joseph Wielar & Co. in 1907. Henry Freeman is listed as a partner in 1908, and the business name changed to Royal Storage Warehouse in 1909. It remained the Royal Storage Warehouse until the name changed to Regal in 1920. A photo on the New York Public Library's Digital Collections dated 1932 shows a sign for Regal Storage Warehouse Co. on a one-story shed-like building next door to 159-161 E. 126th St.
Another figure at Regal Storage Warehouse was Stephen John Hassett (1882-?). He was listed as secretary-treasurer in Polk's 1933-34 New York City Directory. Earlier Hassett was a partner at Monarch Auction Co., 161 E. 125th St., and later he had his own business, Stephen J. Hassett, Inc., at 207 E. 125th St. In 1942 Hassett was accused of theft by an "elderly recluse," Alice Jones. As described in the New York Times, 13 March 1942, pg. 13, "Dressed in a ragged array of ancient clothing, Alice Jones, who thinks she is 'about 70 years old,' walked into the West 126th Street Station yesterday and reported that some one had stolen $10,000 in cash and bank books showing deposits of more than $40,000 from her rooms at 225 East 125th Street. A few hours later detectives arrested Stephen J. Hassett, 60, an auctioneer of 569 West 125th Street, and Frieda Poliener, 56, his bookkeeper, of the same address. They were charged with burglary and grand larceny. Miss Jones, the police said, is a partner in Hassett's auction business and had named him as a beneficiary in her will. Miss Jones told detectives that the money, which she ordinarily keeps pinned in her clothing, was stolen from a wooden coal box near her bed. She said she discovered the loss the morning after Miss Poliener had come to her rooms to bring her 'something nice - something to make you sleep well.' The gift was a jar of prunes. Miss Jones said she ate the prunes and never slept so well before in her life. ... Detectives said they found fourteen pass books on New York savings banks in the Hassett auction rooms and an unnotarized will made by Miss Jones in the safe. The elderly recluse owns two apartment houses." A follow-up story in the Times the next day included, "Loquacious Miss Alice Jones, who said her father thirty-five years ago had told her she was 35 at the time, appeared in the Felony Court yesterday as a compainant against Stephen J. Hassett, 60, an ex-convict and confidence man of 569 West 125th Street, and Miss Frieda Poliener, 56, bookkeeper in his auctioneer's establishment at that address. ... Hassett, because of his previous police record, showing a sentence from General Sessions to Elmira Reformatory in 1905 as a safe burglar and another in the Essex County Jail from Newark, N.J., in 1908 as 'a flim-flam artist,' was denied bail and committed to the Tombs to await action by the grand jury." 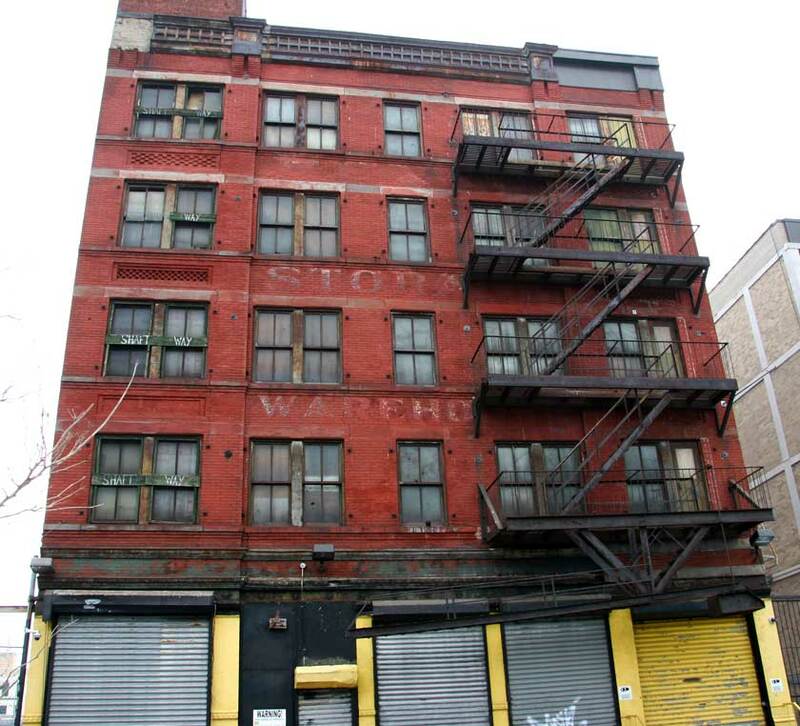 Henry Freeman and Joseph Wielar were also proprietors of Cooke's Storage Warehouse at 209-211 E. 125th St., and of Cooke's Auction Rooms at the same address. Henry Freeman is listed in connection with Cooke's Storage as early as 1892, and Joseph Wielar in 1899. Cooke's Auction Rooms advertised themselves as established 1869, and "Justus Cooke, auction" appeared in the Trow New York City Directory in 1872. This ad for Cooke's Rooms, citing Joseph Wielar & Co. as proprietors, appeared in the New York Herald, Friday, 20 January 1911. In 1913 a petition in bankruptcy appeared in the New York Times, 22 July 1913, pg. 9, as "Joseph Wielar & Co. - A petition in bankruptcy has been filed against Joseph Wielar and Henry Freeman, who compose the firm of Joseph Wielar & Co., also doing business as Cooke's Auction and Storage Rooms, dealers in furniture and storage at 211 East 125th Street, by Charles L. Greenhall, attorney for these creditors: Morris Lipp, as the Greater New York Bedding Company, $500; Jacob Abrams, $50, and William Rung, $25. . . . The business was started many years ago by Justus Cooke, and after his death it was purchased by Mr. Wielar in 1898. In May, 1912, they asked creditors for an extension, and a committee was appointed to supervise matters. Otto A. Samuels, their attorney, said yesterday that their present trouble was due to dull business and slow collections; that the liabilities were $29,000 and assets $15,000." Cooke's Storage and Auction Rooms survived long after this bankruptcy petition. A photograph by Percy Loomis Sperr (1890-1964) in the New York Public Library's Digital Collections dates from 1934. Others connected to Cooke's Auction and Storage were the husband and wife team, William Holzwasser (1858-1920) and Lena Holzwasser (1868?-1939). They were in business with their own auction house at University Place & 12th St. before their association with Cooke's, which seems to have begun around 1900. This ad for L. Holzwasser & Co. appeared in the New York Herald, 18 January 1897. Another Cooke's associate was Herman Hochstein (1882?-1947). Like Steven Hassette's elderly recluse, Herman Hochstein seemed somewhat uncertain about his birth date. When he registered for the World War I draft in 1918 he said he was born 15 Sept. 1878. But in 1942, for the World War II draft he said 15 July 1882. Rather than an auctioneer, Herman Hochstein consistently referred to himself as a furniture dealer. Cooke's combined auction, storage and furniture as one integrated business. Cooke's Storage Warehouse was listed in the Manhattan telephone directory through 1975.